No question, no. 1 versus no. 1 lived up to the hype. However, in the first of two regular season matchups between current AP no. 1 Duke and current coaches no. 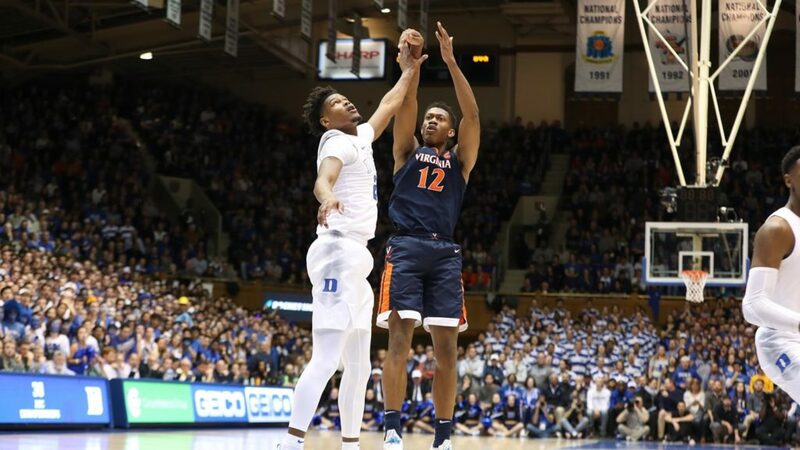 1 Virginia, it was the Blue Devils who came away with a 72-70 win over the Cavaliers in front of a raucous Cameron Indoor Stadium crowd. Duke played without freshman point guard Tre Jones, but the Blue Devils had the luxury of having the potential top two overall draft picks in the 2019 NBA Draft at its disposal. Virginia simply had no answer for either RJ Barrett – a versatile, long and skilled 6’7″ wing – or Zion Williamson – a super-strong 6’7″, 285-pound with dynamic athleticism. The duo combined for 57 points, including 28 in the first half and 29 in the second. A third potential 2019 lottery pick for the Blue Devils, freshman Cam Reddish, chipped in nine points and eight boards. Things started well for the Hoos, who entered the game as the nation’s lone unbeaten (thanks to Wisconsin’s win over Michigan earlier in the day) and was riding a 12-game road winning streak in ACC play (including a win last year in Cameron), as junior point guard Ty Jerome sank a floater to give the visitors a 2-0 lead. Virginia held leads of 5-3 and 7-5 but couldn’t contain Duke’s onslaught of drives and offensive rebounds. By halftime the Blue Devils had nine offensive rebounds and 11 second-chance points, as well as 24 points in the paint. Duke would stretch its first-half lead to 29-22 with 5:32 remaining before UVA fought back to within one at 33-32 on a Kyle Guy fast-break layup. The Hoos had a chance to grab the lead before halftime but Guy missed an open 3 at the 1:23 mark. Duke capitalized with another second-chance bucket from Williamson and a Barrett layup off a Braxton Key turnover. Jerome missed the front end of a 1-and-1 to end the half, and Virginia trailed by five, 37-32. After an intense first 20 minutes, the game settled down at the start the second-half. Duke went scoreless in the opening 2:53; however, aside from a De’Andre Hunter layup, the Cavaliers couldn’t take advantage early. UVA kept battling, though, and pushed ahead 43-42 on two Key free throws at the 14:01 mark. The two teams would change leads 11 times over the course of the next four minutes and 27 seconds, with UVA regaining the lead a final time, 53-52, on a Jerome jumper with 9:49 left. The Hoos tied the game at 55, but two more points in the paint from Barrett boosted the home team to a 57-55 lead. The Cavaliers would close to within one three different times in the final stretch, including one final time when a Hunter layup got UVA to 61-60 with 4:26 remaining. Barrett took over from there, as the freshman finished the game out with eight of Duke’s final 11 points, including 4-of-4 free throws in the final minute (he was 7-of-11 from the foul line in the game). Meanwhile, Virginia missed four straight shots before a Key dunk with 37 seconds left, scoring only a Jerome free throw in almost four minutes time. The offensive drought proved costly. UVA would get as close as three points but the Blue Devils made their lead hold from the charity stripe thanks to Barrett, two free throws from forward Marques Bolden (his only two points of the game) and a free throw from Reddish. Hunter knocked down a jumper at the buzzer for the final score. After missing its first three shots, Duke made 12 of its final 16 and wound up shooting 63.2% from the field in the second-half. For the game, the Blue Devils made 51% from the field and finished with 46 points in the paint, 13 second-chance points and 15 fast-break points. The latter is the most UVA has given up all season. Outrebounded 20-12 in the first half, Virginia closed the rebound deficit to two – 32-30 – by game’s end. Virginia shot 52.8% for the game, enjoying success on the drive throughout, but made only 3-of-17 from beyond the arc, missing on some open opportunities from beyond the arc in both halves. Hunter led the Hoos with 18 points, 11 of which came in the first half as he put on a display. Jerome and Guy added 14 points apiece, while Key provided 11 points off the bench. Center Jay Huff contributed four points (including a highlight reel dunk) in a reserve role and freshman point guard Kihei Clark scored two points in over 18 minutes of play. In total, UVA’s bench outscored Duke’s, 17-0, but it wasn’t enough to overcome the efforts from both Barrett and Williamson. The loss is Virginia’s first of the 2018-19 season and drops the Cavaliers to 16-1 overall and 4-1 in conference play. The Hoos return home on Tuesday for a conference tilt with Wake Forest. In three weeks time, Duke travels to John Paul Jones Arena to take on UVA.